I may not be one of those women who pile on tons of creams on their faces and take forever to finish their skincare rituals but I do care about my skin. Especially now that I’m in my late twenties, keeping my skin moisturized has become one of my main skincare concerns. Yes, I’m not afraid to age but that doesn’t mean I want my age to show on my skin in the future. No one wants saggy, wrinkly skin so we have to keep our skin hydrated and looking young, right? You see, our skin is constantly losing moisture, much like a leaky bucket. Without doing much at all, we can lose about two glasses of water a day by just normal breathing and evaporation from our skin. So imagine how much more moisture we’re losing when we’re actually out and about! Add to that another major cause of moisture loss called skin fatigue. Skin fatigue is the loss of skin energy, which leads to many unwanted changes in one’s skin, including a loss of skin’s ability to hold on to moisture, causing skin’s “leaky bucket” to become even more leaky as a result. 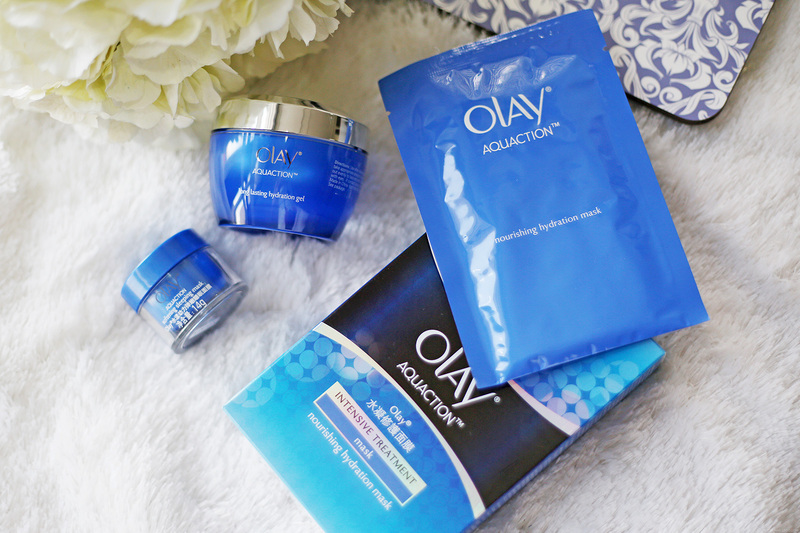 It’s a constant battle we have to fight, which led me to discovering Olay’s new hydration range called Olay AquAction. Olay AquAction brings two powerhouse ingredients namely, WSK and Niacinamide, together in its new breakthrough HydraLock technology to deliver 24-hour non-stop intensive hydration. WSK is an ingredient extracted from the white jelly leaf and is renowned throughout ancient Chinese history and modern times for its beauty-enhancing properties. Surprisingly, it actually outperforms hyaluronic acid, the gold standard of hydrating ingredients, in its ability to fill and seal skin’s leaky bucket. Most hydrating products out in the market usually just contain hyaluronic acid and focus only on filling skin’s leaky bucket. However, as I’ve said, we still have to deal with skin fatigue as well. If we don’t address this issue, skin will not only get drier, but it will become less responsive to hydrating ingredients. This is where Olay AquAction’s second key ingredient, Niacinamid, comes in. It brings the skin energy level of aged cells back to more youthful levels, so that over time, it gives skin the energy to renew itself, and make components that enable skin to hold onto its own moisture more effectively. Thus, it keeps skin hydrated and bouncy in the long-run. So here’s the first Olay AquAction product that I’ve added to my skincare routine. The Hydration Gel hydrates my skin with just one application and continuously moisturizes for up to 24 hours. It recovers skin moisture 2x faster and increases skin moisture by 170% in just 30 minutes. Now those are what an impatient girl like me needs–fast results and multiple benefits. To apply, just take 1 cm diameter of the product and place 5 dots on your forehead, under the eyes, and near the mouth. Then gently spread it all over your face. This product feels more watery than oily so it doesn’t have that sticky feeling I hate so much on moisturizing products. It’s very light and leaves you feeling fresh afterwards. Use it day and night. It’s perfect for soothing sunburnt areas too. This second product is called the Sleeping Mask. It gives intensive hydration all night so you can wake up to 400% better hydrated skin. It also effectively controls skin oils to help achieve water-oil balance and bouncy hydration. Take a generous amount of the product and like the gel, place 5 dots on your forehead, under the eyes, and near the mouth. Gently spread the product onto your skin for best result. Use it before going to bed. I used to think that because I have combination/oily skin, I don’t really need hydrating products like this. But when I used this product, I really saw the difference. My skin feels more supple! 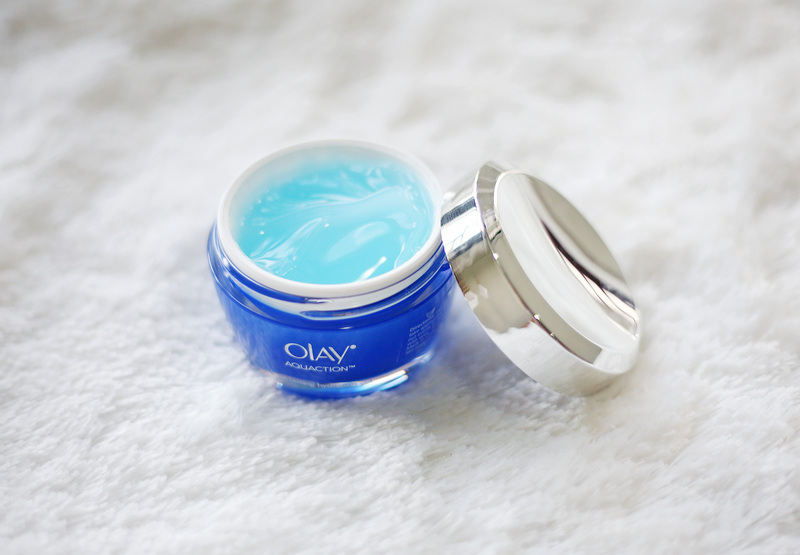 Last but not the last is Olay AquAction’s Hydration Mask. It’s a face-fitting stretch mask with hydration essence that contains mineral ingredients similar to those in natural hot springs. It’s formulated with Vitamin B3 and Vitamin E with an eye patch design that helps provide hydration to the eye area as well. To use, gently stretch the mask upwards from chin to the sides of the face. Peel it off after 15 minutes. Then, massage the extra liquid on your face. Use this product only once or twice per week. When I tried it, it definitely felt more intensive than the gel and sleeping mask. My skin felt the most moisturized after using this. There you have it. These are the new additions to my skincare ritual. I know a lot of you may think that you’re still young and can totally get away with it. But believe me, if you want to keep your skin looking young and healthy, you won’t be able to do this with dry skin. Skin hydration is the secret to beautiful, bouncy and elastic skin. Thanks camille! Will definitely look into this one. Would you recommend any moisturizer with spf? Something that i can use under makeup? Thanks a lot! Yay! thanks for introducing this new product! new moisturizer for me! Moisturizer is a must for me because I have really dry skin :( Up to now I’ve been using olay moisturizer (the one in a white circle bottle) too but now that they have a new product I better switch now haha :) I’m sure it’s new and improved and can help a lot more :) thank you for this! Mythical brand! A must indeed! Go for it! :) Hopefully you’ll love it as well! Hi Sam! For my makeup routine, just search “makeup” on my blog and you’ll see it easily :) As for moisturizers, I think Olay really has some of the best :) Sebamed toners are good! I want that skin too! Your skin is perfect! Natural beauty. I have oily skin too Miss Camille,so I haven’t bought moisturizing products. Yet, I realized I still have to hydrate my skin, especially my face :) Thank you Miss Camille! 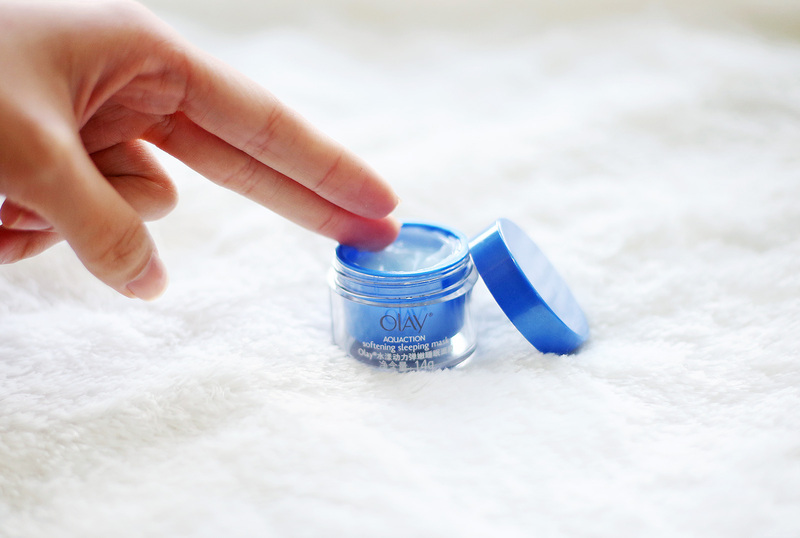 :) Anyway, what Olay product do you use to prevent your skin from getting oily after hours? That’s a problem for me and I don’t want to rely on powders or matte foundation for this.